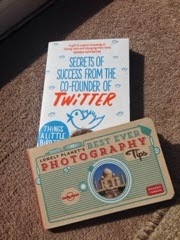 I saw the Twitter book on IG the other day and it looked interesting so I thought I'd give it a go and from the hastily read whilst the children play/eat/sleep bits it does seem to be ticking all my boxes. Such an extraordinary man and a real eye opener as to how businesses operate. I've only flicked through the photography book so far so can't really say whether its a winner yet. I've suddenly got into YouTube (I know, kinda late to that party). I used to think it was only funny kitten clips and mad pranks but I'm now making my own little videos over at The Bubbababble and I'm also now subscribing to loads of new channels. So if you have a fab channel you watch or have your own then please let me know in the comments as I'd love to subscribe to a few more. The sun has indeed got his hat on over here in South East London (or Kent to the rest of us). It's been sandals and summer hats. Even my boy got in on the act. 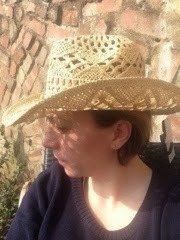 My hat is from F&F Tesco and I do love a cowboy hat and each year I buy a new one. This gives enough coverage with a good structure whilst still being floppy enough to carry around. I downloaded the latest Paloma Faith album this week, it's been out a while. It's a great motivational album and I often listen whilst working out to get me in the zone. As mentioned earlier, we've been making videos and our latest contribution is this one. Our game of 'If you were....' it's very basic but lots of fun. We found out our primary school placement yesterday. I was so nervous all day....but we got the school we wanted (the one she attends now). Such a relief. 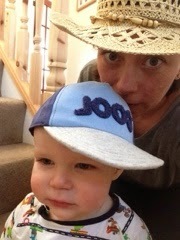 And my boy turned one on Wednesday and we had a lovely afternoon eating cake and playing, it was simple and fun.